Such a wonderful kit to work with. 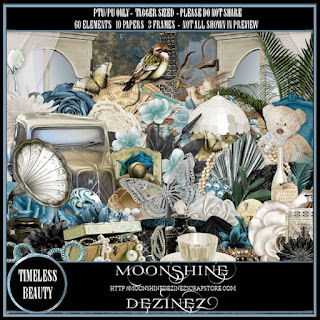 Timeless Beauty has 60 PNG elements, 10 papers, and 3 frames. Gorgeous kit with a Victorian Era feel. This kit will fire up your inner muse and have you creating beautiful, timeless tags. Shades of blue, cream, and black color scheme. I paired this kit with tubes by ©Fiodorova_Maria and © Stan_Dudin, both are available at Pics for Designs..